Wireless MAC filtering lets you block devices from your network or create a whitelist for allowed devices that can connect to the internet. If you want to prevent unknown devices from connecting to your wireless router, MAC filtering is your answer. A MAC address is a unique physical address assigned to every network interface or NIC (network interface controller) on your device. It enables your device to communicate on your home or business network. This includes your computer, your tablet, your phone, your Amazon Echo, your Xbox, and even your washing machine—if it connects to your network. If it talks on your network, wireless networks included, it has a unique MAC address that never changes. 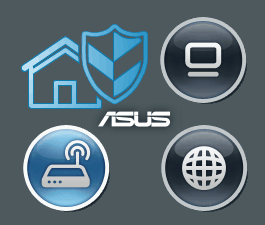 On an ASUS router, you have two options for using MAC filtering. Accept mode is a whitelist. You specify which devices are allowed to connect. Everyone else is blocked. Reject mode is a blacklist. You specify which devices are not allowed to connect. Everyone else can use the network. A whitelist is the most secure, but it requires more hands-on management, and you need to have a comprehensive tally of all the devices that connect to your wireless router. If you forget something—a Blu-ray player, a thermostat, or a webcam, for example—then it won’t work. If it’s been awhile since you configured your MAC filtering whitelist, and you’re having trouble with a new device, it’s easy to forget the extra step of adding the new MAC address to your filtering rules. Personally, I recommend a whitelist for a separate band that you set up for kids or frequent visitors. This can be used in lieu of or in addition to a wireless guest network. To be honest, I’m not sure what you’d use a blacklist for that you can’t also do with a password from a security standpoint. For parental controls, a black list can help you allow internet access on a laptop but not on a gaming console I guess? 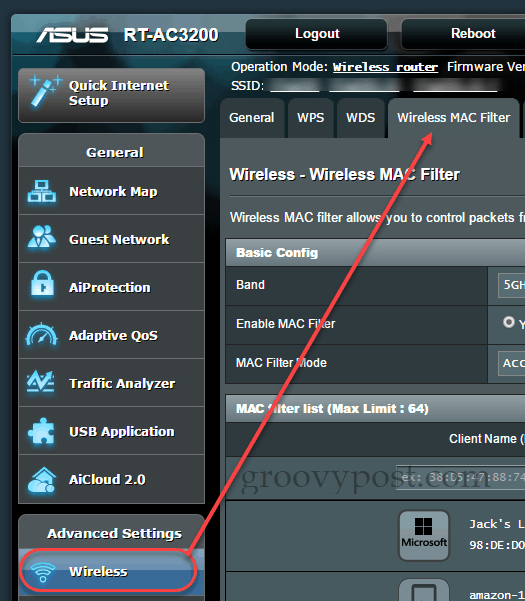 Here’s what you do to set up either wireless MAC filtering in accept mode or reject mode on an Asus Router. Go to Wireless and then Wireless MAC Filter. Select a band, if you have multi-band router. 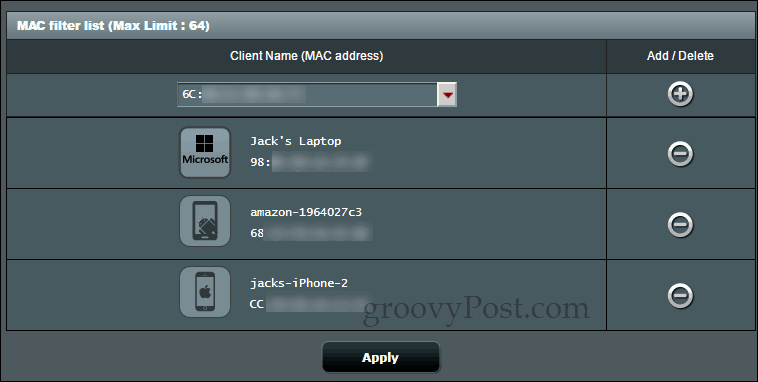 In the next pane, choose a device from the Client Name (MAC address) column. If you’ve already connected the device to the network, it’ll show up automatically in the list. Otherwise, you’ll have to enter the MAC address manually. That’s all! Now, if you chose to use accept mode, only the devices you specified will connect. If you used reject mode, then devices you specified will be blocked. If you try to connect to the network from a device that is filtered, then it simply won’t work. You won’t get any error messages or block warnings. How are you using MAC filtering on your router? Let us know in the comments. You are right, it is comically easy to spoof a mac address and layering your security is a good idea. A whitelist approach is going to be the most secure for mac filtering. For someone to exploit it, they would have to spoof a mac address on the white list. It’s easy to scan a network and find all the mac addresses for connected devices, but it’s harder to pull off if you can’t connect to the network. While not foolproof, a mac address whitelist is far from useless. I have recently moved to an ASUS AC3100 router from a Netgear X7 and find it to be superior in handling the network traffic. However, there is one aspect of the Netgear that I prefer. I choose to utilize MAC Id security and the Netgear allows you hat is called Access control, with Access control turned on, a device can request access to the wireless network as normal but will not be granted access until the network administrator logs into the router and either accepts or denied access to the device. Once accepted The device can then be edited to enter a name and shows up on the list. This much more convenient than having to search each debice individually to find the Mac id. ASUS May want to consider a similar design to their interface. I would like to set up an access system which would whitelist my devices for access 24/7 (with password) but limit other devices to access at specific times. Is this possible with this router?